All the articles discussed & analysed here are related to all five platonic solids. A certain no. of the identical circles are touching one another on a whole (entire) spherical surface having certain radius then all the important parameters such as flat radius & arc radius of each circle, total surface area & its percentage covered by all the circles on the sphere have been easily calculated by using simple geometry & table for the important parameters of all five platonic solids by the author Mr H.C. Rajpoot. 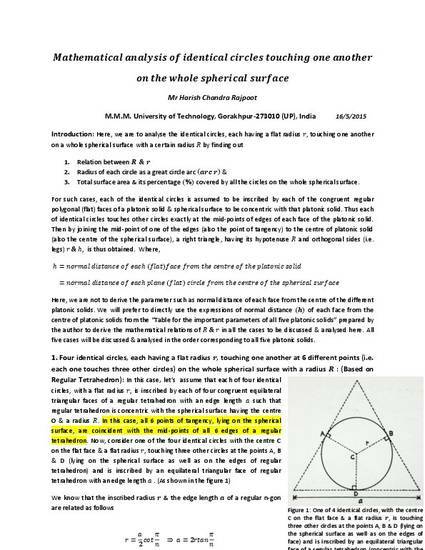 These parameters are very useful for drawing the identical circles on a spherical surface & for designing & modeling all five platonic solids having identical flat circular faces.